A wucai piece from the collection of Galerie Nicolas Fourney. Beginning his reign at a youthful 15 years of age, the Kangxi Emperor (r. 1662-1722) had the longest reign in Chinese history. Perhaps out of a need to live up to the position he found himself in as little more than a child, he pursued a vibrant life of scholarship in many arenas. He was especially committed to reviving dying industries and utilizing ancient practices in fresh applications, one of the results of which was innovations in glazing techniques. Two Imari Chinese porcelain pots-pourris with engraved gilt-bronze mounts, circa 1720. Sotheby's. 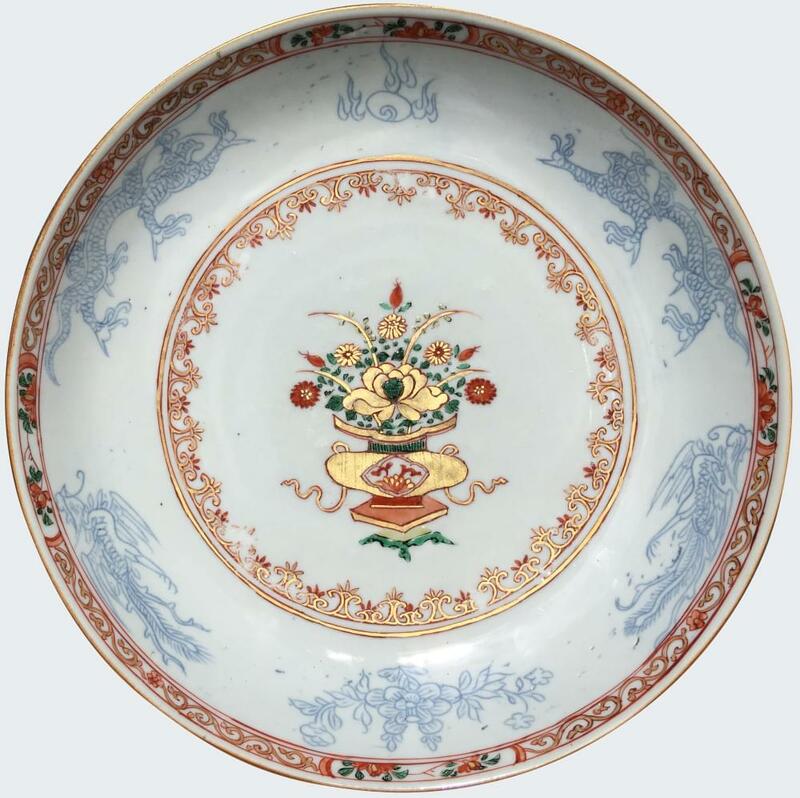 One of the glazes characteristic of the Kangxi reign is known in the West as ‘powder blue,’ which is notably different from the styles of the Yuan dynasty that preceded it in its delicate subtlety. 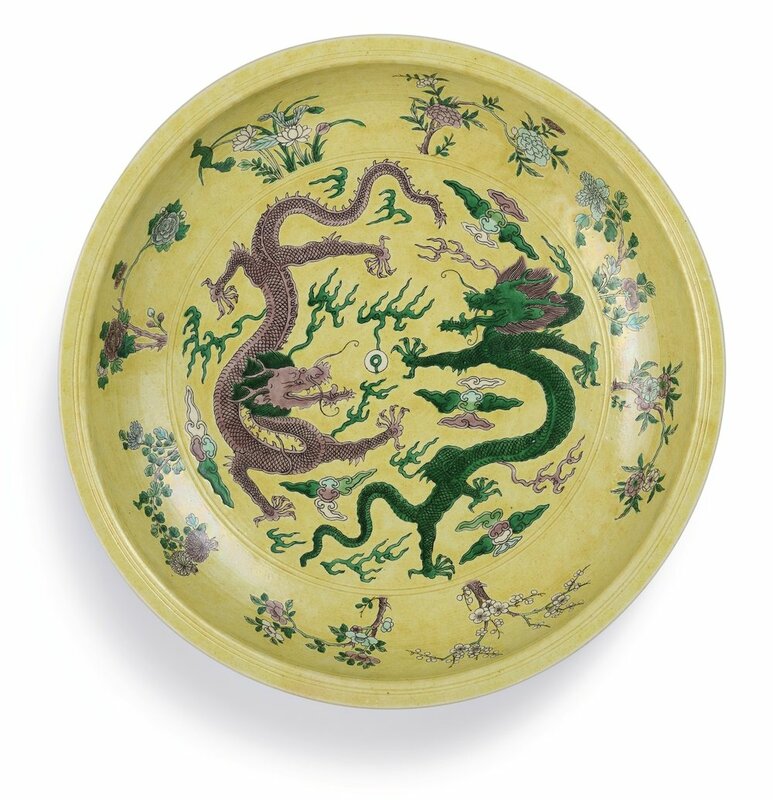 However, the style most commonly associated with the period is wucai, which translates to “five colors,” and is known in the West as “famille verte.” According to antiques dealer Anthony Grey, in this style, too, the Kangxi period is noted for its light, translucent quality. The lack of luster on and iridescence around the blue and green enamels can usually be used to spot an imitation, for which there at least fifty nineteenth century versions of for each genuine Kangxi wucai piece. This piece from Sotheby’s is an excellent example of both glazing techniques, displaying wucai figuration on a powder blue ground. Apart from surface level progress in the porcelain arts, conceptual strides were also made. According to an introductory slideshow put together by Sotheby’s, “during the Kangxi reign, three dimensional utilitarian wares were transformed into virtual dioramas. Swelling vases, conical cups, cylindrical brushpots were suddenly cinematic in scope.” In fact, much of the imagery that adorned these porcelain works was pulled from the already popular narrative medium of woodblock printing. One of the characteristics of these narratives is their typically hierarchical nature that highlights the central characters. This was apparently quite the sea change, as the arts of China had not previously focused on figural representation in secular applications. The Rouleau vase was one of many new shapes introduced during the Kangxi period, and provided an excellent backdrop for narrative imagery. 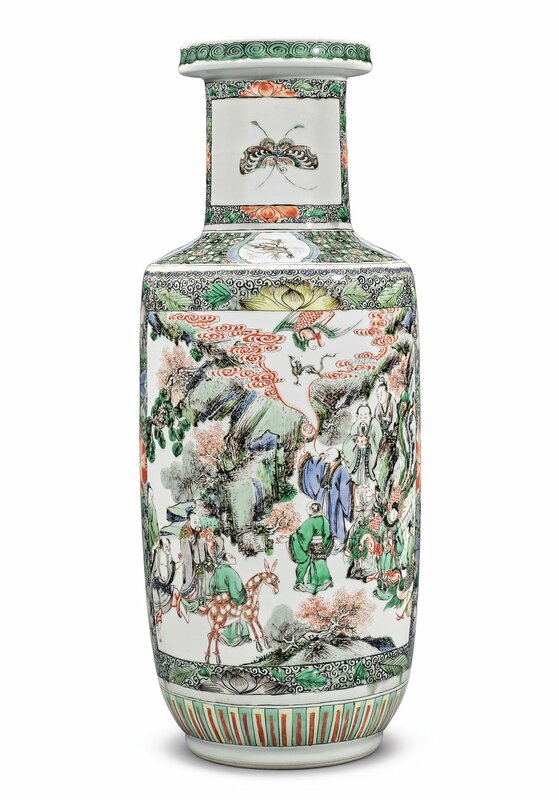 According to its lot description from Sotheby’s, the scenery depicted on this vase hints at its intended uses: one includes animal life and the Eight Immortals, suggesting a birthday present with its message of longevity. The second scene is of a successful looking scholar riding off on horseback after saying goodbye to his son, indicating ascension, perhaps in a civic regard. These types of well-wishing sentiments were typical subject matter for the period. From an aesthetic perspective, its use of depth achieved through tonal and value variations, dynamic, balanced composition created by diagonal thrusts, and intricate detailing makes this piece a prototypical example of the advancement achieved in the wucai technique during Kangxi’s reign. Another wucai piece from Galerie Nicolas Fourney. A non-figural wucai piece from Galerie Nicolas Fourney. A sancai figure of Li Bai. Sotheby's. 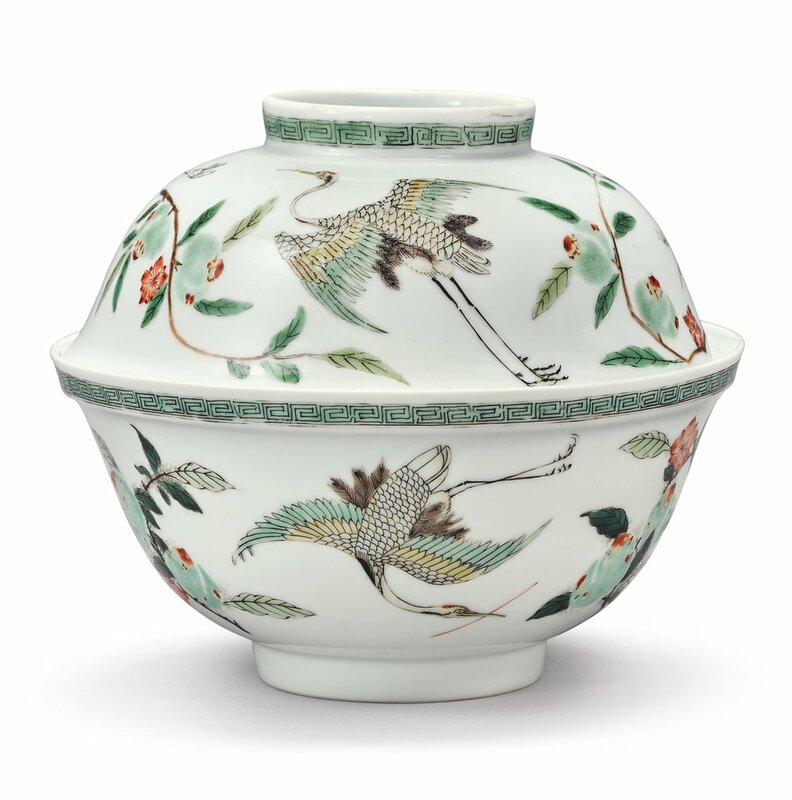 Another style that has inspired countless imitations since its origination is the Imari ware of the Japanese port town now known as Arita. What became its distinctive palette was influenced by Korean artists and featured a blue underglaze with reddish-orange accents and sometimes gold (more frequently in Japan than in China, where it was a more costly resource). 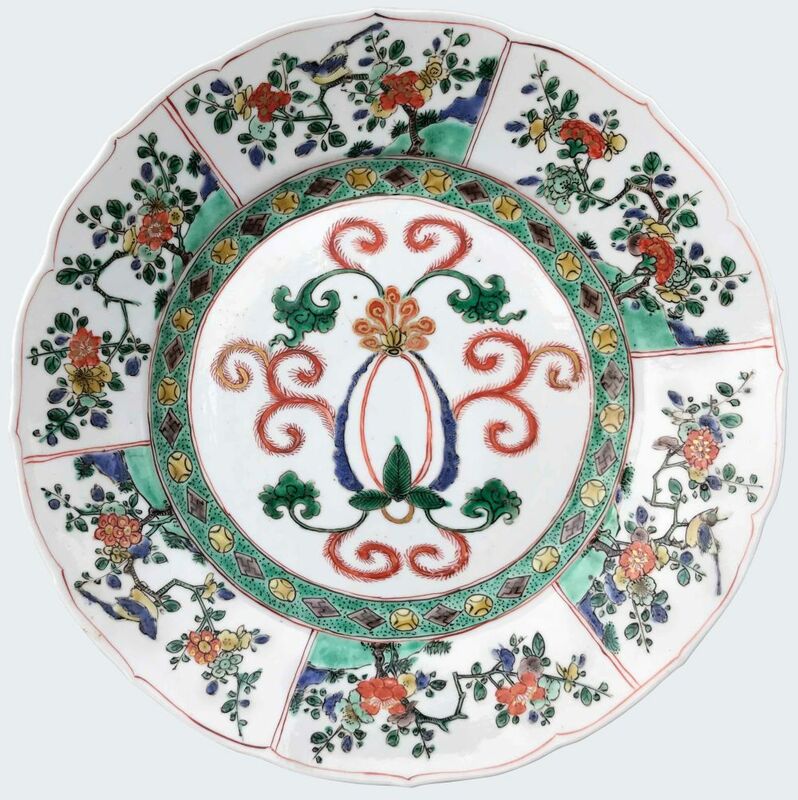 After essentially locking down trade with the Dutch East India Company, the significantly less expensive export of Chinese Imari dominated the market by the early 18th century and continues to be made today. 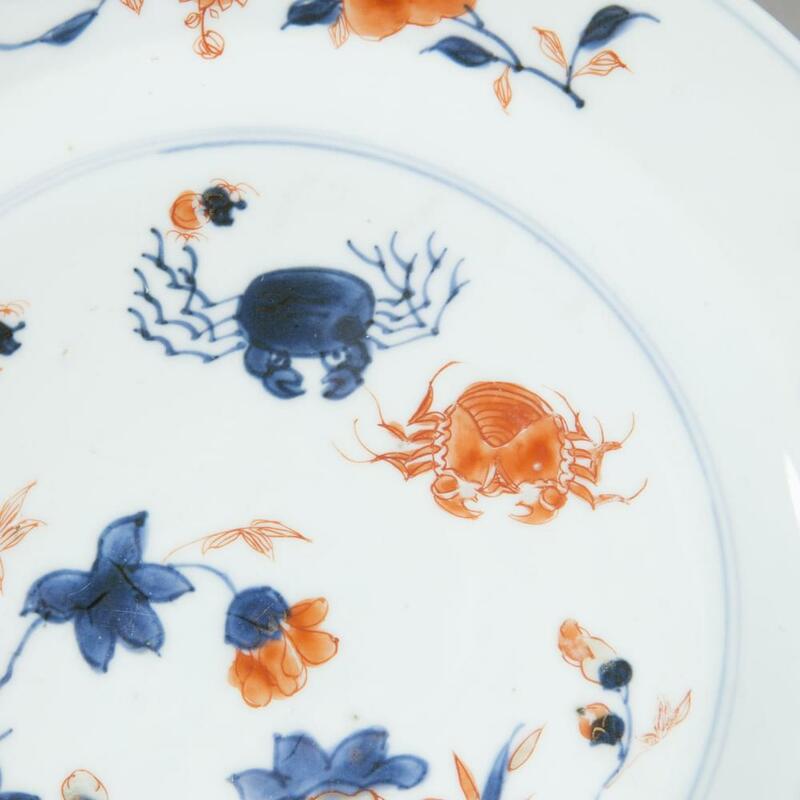 A detail of a Kangxi Imari plate from Galerie Nicolas Fourney. The following pieces from the magnificent collection of Galerie Nicolas Fourney also display the Imari palette. Enjoy!